LONDON (AP) Matt Emmons' final shot of the Olympic 50-meter three-position rifle competition was terrible. Again. Only this time, he was thrilled. After seeing gold medals - or any medal, for that matter - slip away with last-bullet debacles in Athens and Beijing, Emmons finally made his way to the Olympic medal stand in the three-position event on Monday. 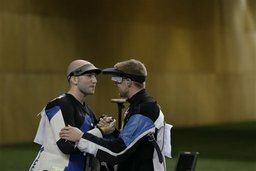 As a sport, shooting goes back more than 500 years, and as such it's been a mainstay of the Summer Games program outside of just two Olympiads. In 2012, 390 men and women from around the world will converge on the historic Royal Artillery Barracks in southeast London to compete in the three disciplines of rifle, pistol and shotgun. Find out more about the event's history, the types of guns these marksmen will be firing and what they'll be aiming for - in addition to a gold medal. Shooting Events for the 2012 London Games have been completed.